TRX® Suspension Training® What is TRX? TRX stands for Total Resistance EXercise. TRX Suspension Training helps you build total body strength, balance, flexibility, and core stability for people of all ages and fitness levels. TRX Booty Camp Tuesdays and Thursdays (8:30 a.m. to 9:30 a.m.) Sculpt your legs and tighten your tush with this fun and challenging workout. TRX Booty camp will help you tone your abs and strengthen your upper body. Alternate between functional exercises using your own body weight and gravity for resistance and cardio blasts to burn tons of calories and get you in the best shape ever! TRX Goddess Abs Tuesdays and Thursdays (12:30 p.m. to 1:00 p.m.) If you’ve ever seen a statue of a powerful Greek or Roman Goddess, you’ve probably noticed their finely chiseled abs. This workout focuses specifically on those abdominal and oblique muscles to give your core that extra challenge. No more muffin tops here! With this class you’ll soon have those Goddesses envious of you! On the beaches of sunny Southern California you’ll see people walking, running, biking, rollerblading, surfing, lunging, squatting, doing yoga, and now, TRX-ing. No, this is not a typo. TRX-ing is now a verb! I did not know much about the TRX so I called a local trainer and he put me through an amazing full body workout. I thought I was pretty fit but that workout left me sore all over. I couldn’t believe how my abs were engaged in every exercise. Did I mention my glutes? I’ve done a lot of leg and glute exercises but nothing has ever gotten into my glutes like a suspended lunge. After that workout, I was hooked! 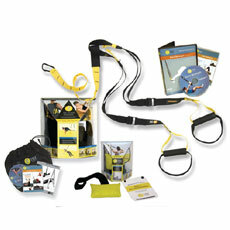 I bought the TRX Suspension Trainer home bundle which includes a TRX, instructional DVD and guide. I also purchased the door anchor so I could try it out at home. Fortunately, there was a trainer certification class shortly after I received my TRX so I enrolled and became a Certified TRX Trainer. The TRX Suspension Trainer was originally created by a Navy SEAL and is the now one of the hottest total body tools on the market. In fact, Men’s Health magazine named it as Best Total Body Tool for 2009. It is portable, light-weight, and convenient to take anywhere! The entire thing only weighs 1.67 lbs. The TRX is a couple of straps with handles similar to what it at the end of a resistance band but has added foot cradles. You can attach your TRX to any stable anchor as long as the anchor point is at least 6 ft. off of the ground. Hang it over a swing set in the park, a pull up bar, Smith machine, or over the side of a life guard station (my personal favorite :D), wrap it around a volleyball post or a tree. I even taught a class at lucy in Manhattan Beach on Fitness Friday. See what I mean, anywhere there’s a stationary object that can handle your body weight you have a place to hook up your TRX. Who can use the TRX? EVERYONE can use it. From professional athletes like Drew Brees and MMA star Brandon Vera to the average Joe. Regardless of your fitness level, you can use the TRX. The TRX allows you to perform a myriad of functional exercises using your own body weight and gravity to increase the difficulty of an exercise. TRX-ing will help you increase your overall strength, sculpt your arms, legs, and core, improve your balance and coordination, speed and agility. There are several DVD’s, YouTube videos, wall charts, and even a fun card game called FitDeck to teach you the many exercises you can do to take your fitness routine to the next level. There are over 400 exercises that you can do on the TRX but don’t worry, you don’t have to do all of them. I trained my brother a few weeks ago and my 8 year old niece had the best time trying all the exercies and just using the TRX as a swing. Have fun, get creative, and get FIT!